Delphine's place: November Release Krafty Hop! Hello everyone! Today we are celebrating the amazing release of ALL of our November stamps at Kraftin' Kimmie Stamps! All FIVE new sets are now available in the shop! So let's hop around and see all the new stamps in action! First up is WINTER WHITNEY! Then these cuties... MERRY CHRIST-MOOSE and BEARY CHRISTMAS! Next we have a fabulous hot bevvie set with a BREW-TIFUL DAY! And lastly adorable critters with FURRY HOLIDAY WISHES! And if you have to have it ALL, we also have our November Gimme Kimmies Kit which includes ALL FIVE of the new stamp sets together and at a discount! But only for a limited time and while supplies last! Also it's Small Business Saturday and we've got a special surprise! To say a special thank you to all you loyal customers, every order placed this weekend will receive a coupon for 20% off your entire order December 13-23! Happy Shopping! 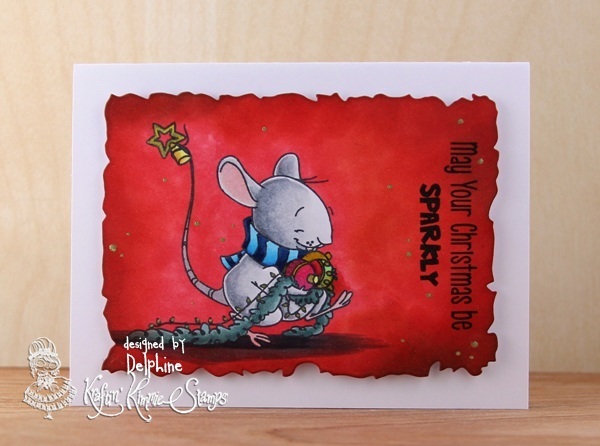 Here is my card for today using an adorable little mouse from the Furry Holiday Wishes!